Kellogg’s and Overwatch have teamed up to bring you the Kellogg’s Overwatch Online Instant Win Game. Play at kelloggswatchandreveal.com now through March 31, 2019 and you could win an Ultimate PC Gaming Room or 1 of 1,000 other prizes. 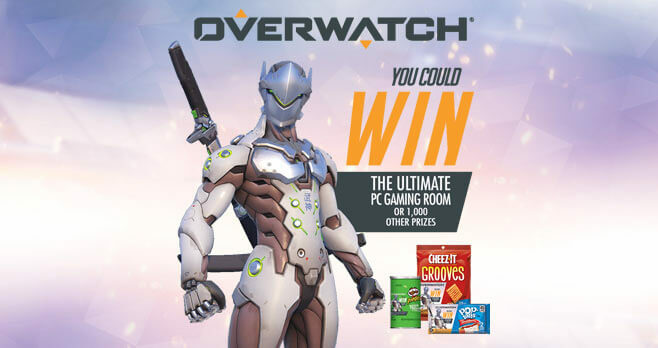 The Kellogg’s Overwatch Online Instant Win Game is open to legal residents of the 50 United States and District of Columbia who are 18 years of age or older at time of entry. The Sweepstakes begins at 12:00:00 AM ET on 10/15/18 and ends at 11:59:59 PM (ET) on 3/31/19. Limit one Game play per Day, per person/email address. The grand prize consists of one Gaming PC (MSI AEGIS TI3 8RF SLK-005US/ARV $3,999.99), one (1) Monitor (MSI Optix MPG27CQ/ARV $499.99), one (1) Gaming Chair (DXRacer Sentinel Series/ARV $479.00), one (1) Mic (Blue Yeti Broadcaster/ARV $199.99), one (1) Webcam (Razer Kiyo/ARV $99.00), one (1) Desk (Apex Desk Elite Series 60”/ARV $799.00), one (1) Headset (Overwatch® Razer Mano’War Tournament Edition/ARV $109.99), one (1) Mat (Overwatch® Razer Goliathus Speed/ARV $34.99), one (1) Keyboard (Overwatch® Razer BlackWidow Chroma/ARV $179.99), one (1) Mouse (Overwatch® Razer DeathAdder Elite/ARV $79.99), one (1) Collectible Overwatch® Mercy Statue/ARV $175.00, one (1) Collectible Overwatch® Genji Statue/ARV $175.00, one (1) Collectible Overwatch® D.Va. Statue/ARV $450.00, one (1) Collectible Overwatch® Widowmaker Statue/ARV $175.00, one (1) Collectible Overwatch® Reaper Statue/ARV $175.00, and one (1) Collectible Overwatch® Tracer Statue/ARV $175.00 (total ARV $7,806.93).. Visit kelloggswatchandreveal.com to enter and see Official Rules for details. WHY I CANNOT ENTER THE GIVEAWAYS CONTEST. WILLNOT BRING UP THE FORM TO ENTER. WHY IS IT SO HARD?